Warm weather is finally gracing us here in Denver. All the snow has now been replaced by thunder, lightning, gale force winds and pounding rain. We can’t seem to catch a break! Spring time in Colorado is something to behold; it’s an adventure in itself, it is Mother Nature wreaking havoc; it is The Rockies keeping us on our toes and it is the sun and the moon playing hide and seek. My favourite season has always been fall because of the beautiful colours of the shrubs and the trees, and also because after a scorching summer, the temperate days of fall are a wonderful reprieve. However, lately I’ve been really enjoying spring time. There is something very soul lifting to see new life all around you. I am amazed that only a few weeks ago the fields and gardens were bare and gloomy; now, they are a lush and vibrant green. One of the things I most look forward to, is the new life on the aspens. Aspens make the most soul soothing sound when the wind ripples through their leaves; they flutter and dance. To see an aspen shiver and to hear it flutter is something I look forward to the most in the spring and summer time. What are your favourite seasons and what is it about them that you enjoy the most? Of course, along with the warm weather comes the desire to eat light, not cook and just lounge around leisurely. Unfortunately, there is no escaping the no cooking part and in my case, lounging about leisurely is out too. Cooking light, I can attempt. Warm weather also brings out the grill aficionados, also known as, husbands. I know that one phrase all too well come summer time: “Do we have meat? I can grill. Do you want me to grill?” Yep, now he wants to cook. So, we grilled last week. I made tandoori chicken, grilled bok choy and this very refreshing and filling, quinoa salad with lots of fresh mint and cilantro. Don’t leave them out, that’s the best part of the salad! My oldest daughter is a pseudo vegetarian…it’s a long story. So, to ensure she has something to eat, I have started making this quinoa salad to give her some protein and fresh vegetables. She eats it as a main dish and we have it as a side. Of course, you can add anything to it. You can make it into a Greek version with Feta cheese and olives, or a Panzanella with basil and chunks of bread; the variations are endless. Last week, I added Yukon potatoes to give some bulk to the salad mainly because I didn’t want to make another side dish for the chicken. It worked perfectly adding a nice potato salad feel to the quinoa. If you have never worked with quinoa before, it is very important that you rinse the quinoa seeds quite a few times. They are covered with bitter compounds called saponins and they can make the cooked quinoa taste funky. I rub it in my fingers while rinsing and I also soak it for a few minutes before cooking. Quinoa is a seed, not a grain and is also a complete protein, therefore, great for vegetarians. It has a grassy taste, a bit like asparagus, I think, and the cooked seeds have a pleasant pop to them when you chew. a large handful of mint, washed and roughly chopped. 1 cup quinoa, rinsed thoroughly. In a medium pot, on medium high heat toast the rinsed quinoa with the oil until the water is dry and quinoa is coated in oil. Pour the 2 cups of water and broth, add the salt and bring to a boil. Once boiling, turn down the heat to low, cover the pot and simmer for 20 minutes. After 20 minutes, turn off heat, remove pot from the heat and leave covered for 5 minutes. After 5 minutes, remove cover and fluff the quinoa with a fork and spread out on a plate or tray to cool. Put all the ingredients in a bowl or a glass jar with a lid. Whisk or shake the jar to blend. Check to season for salt and pepper and add more sugar or honey if you want it sweeter. In a large salad bowl or platter, toss all the salad ingredients together. Add the cooled quinoa and potatoes. Add the dressing, pouring on as much as you want. Toss the salad gently and serve as a main dish or side. So you might have noticed that I am watermarking my images slap in the middle. The last few days, I have been checking to see where my images have been ending up and my posts too. I discovered that one of my images was used on 4 different sites overseas with my watermark at the bottom cut off and no credit to me. Needless to say, I was a bit furious. One of them had the nerve to slap on her copyright over MY photo! I contacted 3 of the 4. I actually got replies from two of them which I promptly used guilt tactics to get them to remove my photos. One of them got quite preachy telling me that in her country, they are happy to share without permission blah, blah, blah and that I could take anything from her website without her permission. Yeah right, because she was “sharing” when she CUT OFF MY WATERMARK and used my photo. I don’t mind people using my photos and recipes, but just ask first and give me credit. We don’t get paid to do what we do and I sacrifice a lot time photographing and testing out recipes. I don’t ask for payment, just some courtesy and recognition through a link back. If any one of you is interested, Laurie Alves from the blog Food is Love has a Facebook page where she researches ways to keep your blog content safe. Check it out, she has some useful info Protect Your Food Blog Content. So, have a great weekend everyone!! I am going to get my nerd on tonight; off to see Star Trek. Can’t wait! Your photographs are so beautiful! Wow if someone stole them from me I would be furious–so glad you found them and nipped that in the bud! Looks like a very refreshing and wonderful summer dish you’ve made! Mary Frances recently posted..Dinner salads with Provencial chicken or 2 dinners in 1! Thank you Mary Frances, yes I was a bit annoyed when I found my photos on somebody else’s site. This is a very flavorful and colorful salad, Nazneen. Yum! I’m sorry about the photo incident — unfortunately, it happens a lot and I’m glad you are taking the necessary measure to try combating this issue. It’s sad that we are often taken for granted for the amount of work that goes into producing a recipe. Thieves are haters and losers. Thanks Kiran. Yep, nothing much we can do, there are these kind of people everywhere. It’s life. Hi Nazneen! This quinoa salad is light and perfect side dish for summer. Love that you prepared with refreshing herbs like mint and cilantro. Hi Nami! Thank you and yes, the herbs add great flavour and freshness to the salad. this looks healthy AND delicous! win win! Thank You Anne, you are too sweet! I think you’ll like quinoa, if you like fresh produce and esp if you like asparagus. It has a grassy taste but the comfort of a grain.I know decent bloggers know how hard we all work to do what we do. It’s frustrating. I will email you and get that information. I know one way you can check, but I don’t know if I know yours. Thanks Anne! sounds like we’re not the only ones getting a lot of rain! A wonderful salad, perfect for summer! Oh man…rain and more rain here! But I like rain so it’s ok….however, I feel lazy and don’t want to do anything! There is no Fall here but it is my favorite season! I even made a “Fall Themed tea party” because of it. I’ve also never tried Quinoa yet but I imagine it tastes like little beans? That’s a wonderful idea to have a fall party! It’s a way to enjoy a season you don’t get to have. Quinoa tastes more like a vegetable than beans. The texture is like seeds and the taste is by grassy. I equally enjoy spring and fall because I love looking at flowers blooming in spring and trees changing their color from green to yellow orange and brown in autumn. Love the versatility of this fabulous quinoa salad just like the seasons. Thanks Balvinder! I know, I’ve been taking salads and throwing in quinoa and it’s great! I love quinoa, and it’s terrific in salads. This one look exceptional. 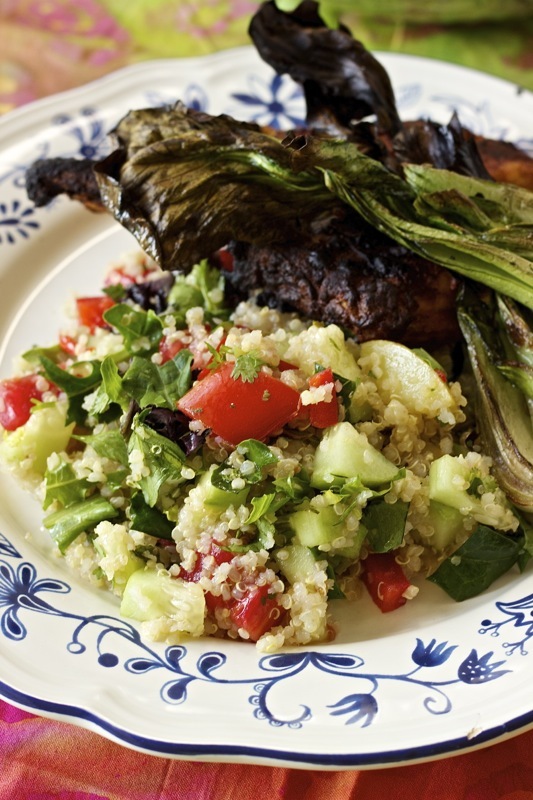 And I love the look of grilled bok choy – I need to do that! I’ve thought about watermarking my photos in the middle. Internet theft is so annoying and can be frustrating. Great links – thanks for those, and this post. Thanks John! Yes, Internet theft is so annoying because its not clear cut and so hard to prove. I figured it was just better to watermark in the middle and not have to deal with it. The grilled bok choy was wonderful! very professional website and pics. ma sha Allah. JAK! Thank you for visiting! I’m a Summer lover, Nazneen. Our Spring is anything but those the poets wrote about. Fall is too over-shadowed by WInter. And Winter is, well, Winter. Give me Summer!!! That sure is a beautiful plate of food you prepared. Everything looks delicious. I bet you were glad to fire up the grill again. I’ll be heading to see Star Trek this week, during the day when there are no crowds. YAY! Yes, Charlie, it’s nice to see spring, even though I do like winter. I honestly think it was so much easier when my children were toddlers! I can help you if you’d like! I love quinoa, here is getting into autumn though, I’ll keep this for summer (good and vegetarian!!) and I’ll try to experiment with some quinoa soups, I had some great ones in Peru! Sounds good Alessandra! I will check out your site for international recipes! Thanks for stopping by! I know! I haven’t been able to contact this one yet but I may just fill out a Google request for copyright infringement. It’s such a headache really. This salad is great for the summer. Hi, Nazneen! Fall is my favorite season as well although I also enjoy spring. I love how nutritious and light this salad is. The mint makes it even more interesting and refreshing…Happy spring!!!! Thanks Denise! Yes, the mint is definitely refreshing and adds so much flavour and fragrance to the salad. Love the sound of this salad, Nazneen. Perfect for summer. Thanks Lail! It really is very refreshing on a hot day, especially s fragrant with the mint and cilantro.